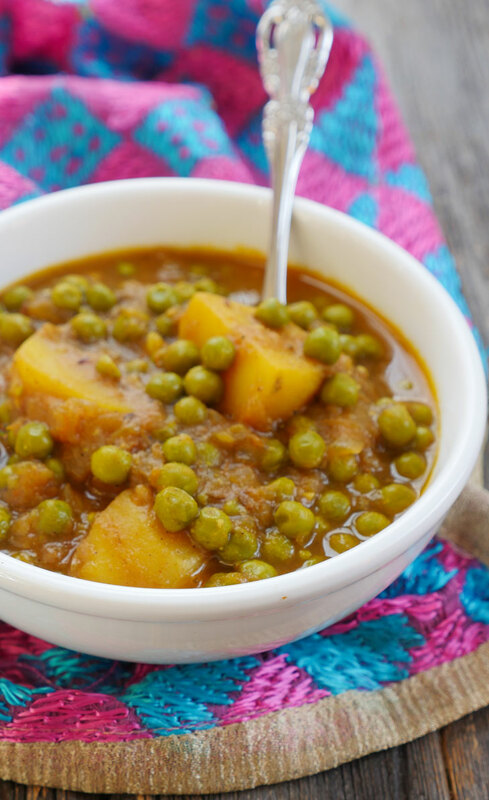 Aloo Matar, a popular Punjabi curry, is a simple and comforting dish. Potatoes and peas are humble ingredients, but when you serve them in a fragrant spiced tomato sauce they turn into something extraordinary. I almost always have potatoes (aloo) in my pantry and a bag of frozen peas (matar) in the freezer. 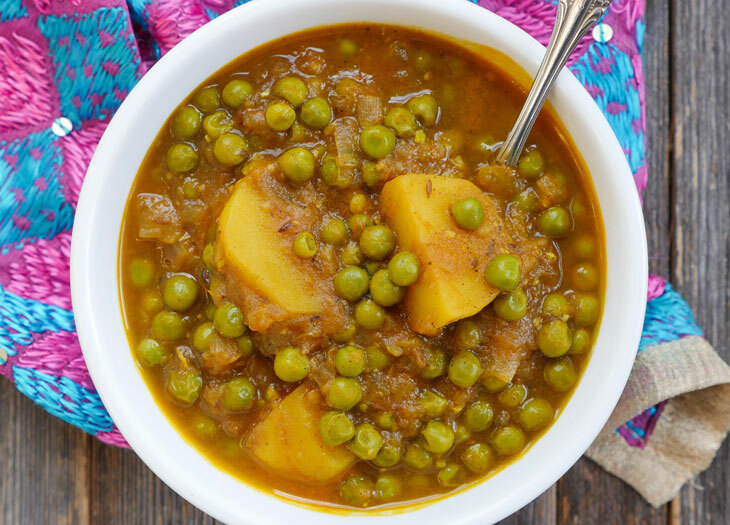 As long as you’ve got those two things and some of my onion masala prepared then you can make aloo matar in an Instant Pot in no time at all. This is an easy, hands-off recipe that is absolutely delicious! This recipe is part of my Indian Onion Masala Series! Click on the image below to find out how to make onion masala, how to store it and to find other recipes that call for it! I am not a vegetarian but if you are, then you must start cooking Indian food if you don’t already. If you can cook Indian food, then you’ll never get bored eating a vegetarian diet. There are SO many tasty Indian veggie dishes out there including this one. 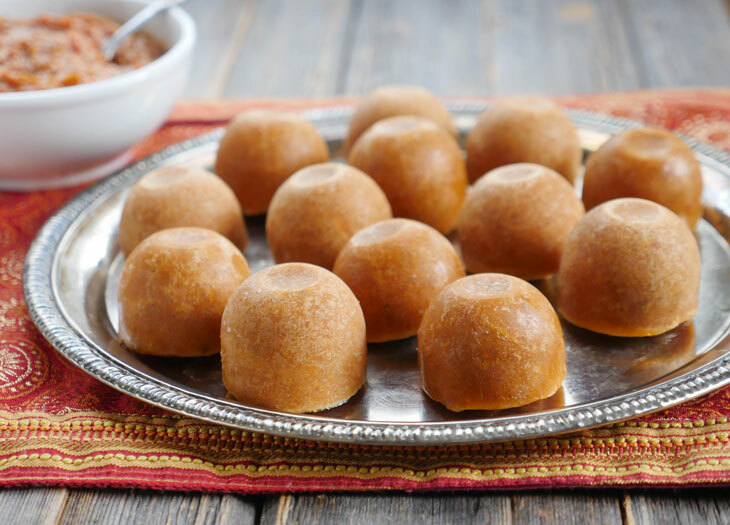 If you’re looking for more recipes, you can find all of my Indian vegetarian recipes here (this list gets updated often). Serve aloo matar with an Indian flatbread like roti or paratha (or if you are gluten-free then use my paleo naan or basmati rice). Or eat it by itself – like a veggie soup! 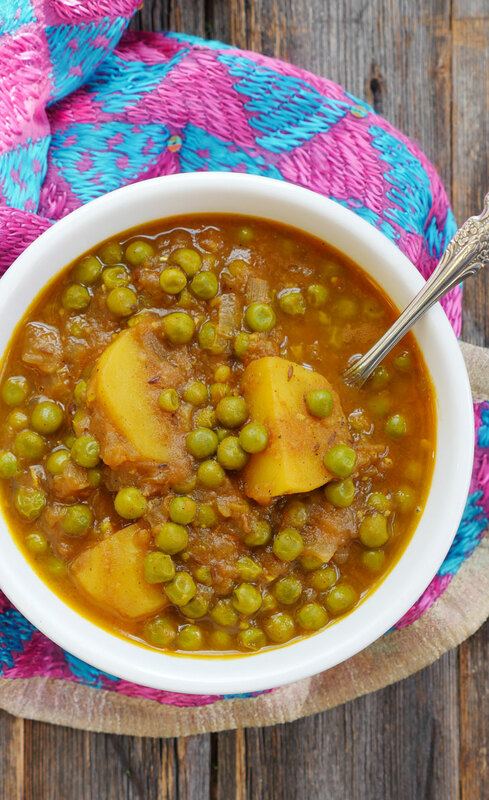 This popular Punjabi curry is a simple and comforting dish. 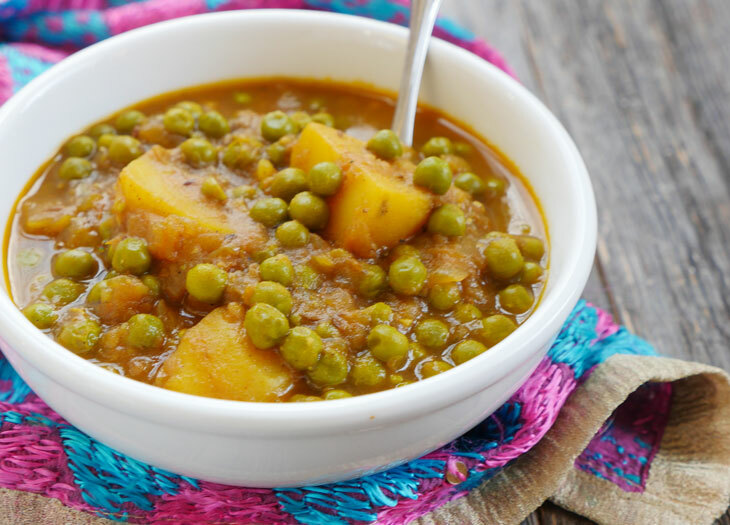 I almost always have potatoes in my pantry and a bag of frozen peas in the freezer and so even when the fridge is empty, I can still create this delicious curry. Potatoes and peas are humble ingredients, but when you serve them in a fragrant spiced tomato sauce, they really shine. Press the sauté button on the Instant Pot, add the oil and allow it to heat up for a minute. Add the cumin seeds and serrano pepper and once the cumin seeds turn brown, add the remaining ingredients to the pot. Secure the lid, close the pressure valve and cook for 5 minutes at high pressure. Open the valve to quick release any remaining pressure. If you prefer a thicker consistency, mash a bit of the potato into the curry. 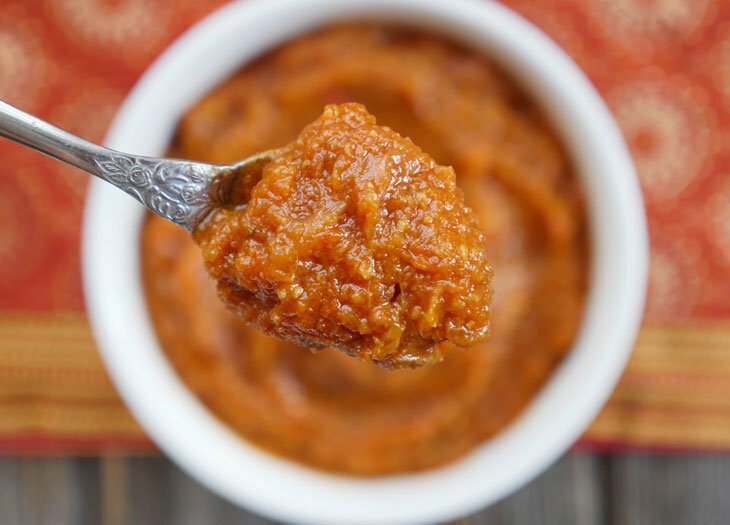 This recipe is part of my onion masala series – be sure to check it out! I made the onion Masala first and then this recipe. I found that the onion Masala wasn’t spicy enough and the Aloo Matar wasn’t as chili-like in consistency as I expected from your comments. Either way, great recipe. I’m just starting out with the Indian food and I use the Breville pressure cooker so I have to modify for the differences between the two machines (although I wouldn’t trade my Breville for the world)!!! I’m really hoping that the Butter Chivken turns out divine. That’ll ge my second dish. I also got ingredients for the Punjabi Chole, your tuna salad and your Saag. I’ll keep you updated on the results. In the meantime any advice, especially in light of my idiosyncratic results today, would be awesome. Hi Cristina, you can adjust the spice level to your tastes! I keep the cayenne minimal in the onion masala recipe to keep it mild – feel free to add more cayenne or other spices if you wish. And sorry for the confusion about the aloo matar – it is not actually supposed to be as thick as chili – I was trying to say it could be a good vegetarian substitute but I’ll remove that sentence from the post. Anyway, I look forward to hearing what you think of the other recipes. Thanks for your response, I understand better. I adjusted the heat in the onion mattar. Will you be posting more recipes that call for the onion mattar? Tonight it’s butter chicken and Saag! I can’t wait!! Thanks! Can’t wait to try the curry chicken! I asked in a different post whether the onion masala can be substituted in recipes that call for the exact same spices? If so, how would the recipe be modified? You can definitely substitute it! It may take some experimenting to figure out the quantity but the more you cook with onion masala, the more you’ll get it! What size should we chop the potatoes? Hi Danny, when I say to “add the remaining ingredients to the pot” that means you can just dump everything in that’s on the ingredients list that hasn’t been used yet 🙂 I hope that helps! Delicious! This one is a keeper for sure. 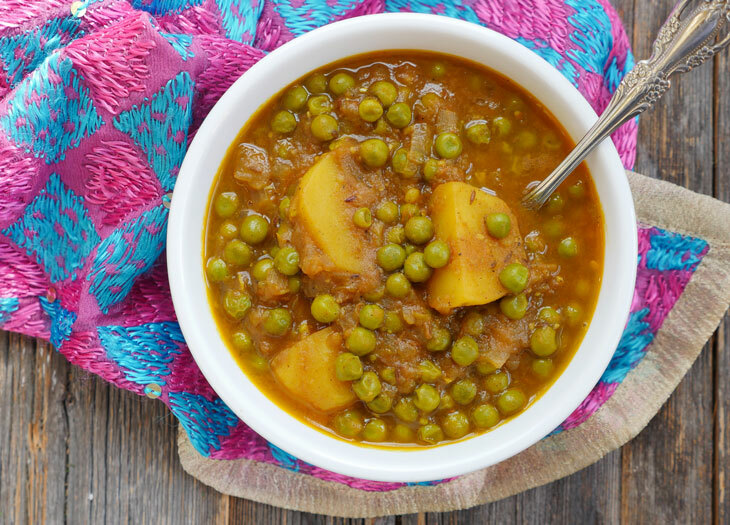 I recently had aloo matar for the first time in a restaurant and wanted to make it at home. Thank you for simplifying this for me! I just made three cookbook version of this recipe (without the onion masala) and it was so good. So easy and so good. I must get around to making the onion masala though! 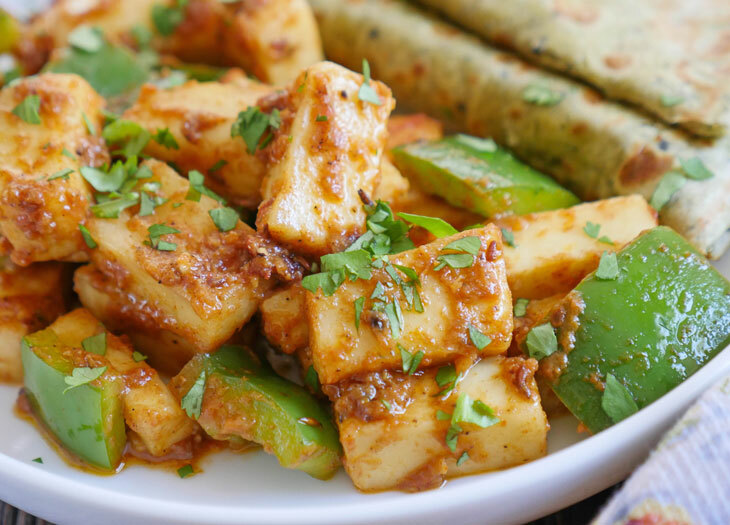 Can you make Matar Paneer as well with this recipe? This came out so good! I followed your advice and mashed some of the potatoes for more thicker consistency and it turned out great. Thank you for sharing this recipe! Thank you for your wonderful recipes! How many servings does this make? Jia, I’d say 3-4 depending on what else you’re also serving – hope that helps!